We’re skipping 10 Thoughts and going straight to the 2,000-word running diary. Hope you enjoy. I’m not doing the 10 Thoughts tonight — mostly because I don’t anticipate being able to come up with 10 Thoughts for this that don’t make me want to stop watching competitive athletics. I did this for the 2012 Fiesta Bowl and it was a lot of fun. Tonight probably won’t be as enjoyable from an outcome standpoint but I have three beers and a true freshman in front of me so let’s see what happens. 6:14 p.m. — I just watched Florida State beat Boston College (!) on a last-second field goal. I am so excited for Jameis. It’s good to finally see some good things happen to good people. 6:18 p.m. — We’re wearing white tonight and oh by the way Mason Rudolph is starting. I hope he brought about four extra pairs of compression shorts. 6:20 p.m. — Oh good, it’s being reported that Mike Gundy is proactively pursuing the Florida job. I thought we’d already hit bottom. 6:25 p.m. — I am strangely looking forward to this running diary. I’m flabbergasted that we’re starting a 19-year-old on the road in a lightning storm against a top 10 team but hey, you can’t win ’em all. 6:26 p.m. — Art Briles just told me that if I live right then things will be all right. Okay. 6:28 p.m. — Bryce Petty annoys me — is this a safe place to say that? Not in a RG3 kind of way but he just seems…odd. I don’t know — I’ve heard good things. Just a perception. 6:30 p.m. — I hope Tyreek gives Gus a reason to Gus tonight. That’s all I’m holding on to right now. 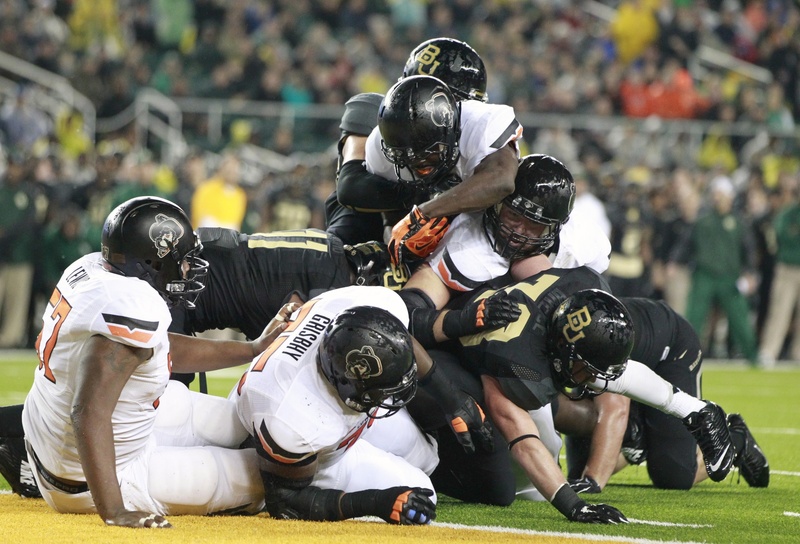 6:31 p.m. — Wouldn’t it be humorous if OSU could keep Baylor out of the title game two years in a row? 6:32 p.m. — I’ll say this, Rudolph can end all the QB races from now until 2018 in 60 minutes tonight. 6:39 p.m. — I had $100 on under 0:30 so yeah I’m not pleased. 7-0 Bears. 6:40 p.m. — Fine, nobody else will say it so I will. I wouldn’t trade 2011 and 2013 for whatever it is that’s going to happen in the next 59 minutes. 6:42 p.m. — What is this 11-man circle behind the line of scrimmage I’m looking at? 6:43 p.m. — Rudolph looks a lot more calm than I feel for him right now. He looked his pulse didn’t even increase on that first drive. 6:46 p.m. — I have to watch this whole thing, don’t I? 14-0 Bears. 6:50 p.m. — I don’t really blame Baylor, honestly. 2011 and 2013 had to sting in ways they haven’t been stung in the last half decade. I just hope they empty it all tonight and don’t bring any to Stillwater in 2015. 6:51 p.m. — Baylor might be kicking off short so they can get the ball deeper in their own territory so they can get more yards on each of their drives. I mean, that’s in play, right? 6:57 p.m. — I’ve seen Tarantino films that were far less bloody than this first quarter. Like, all of them. 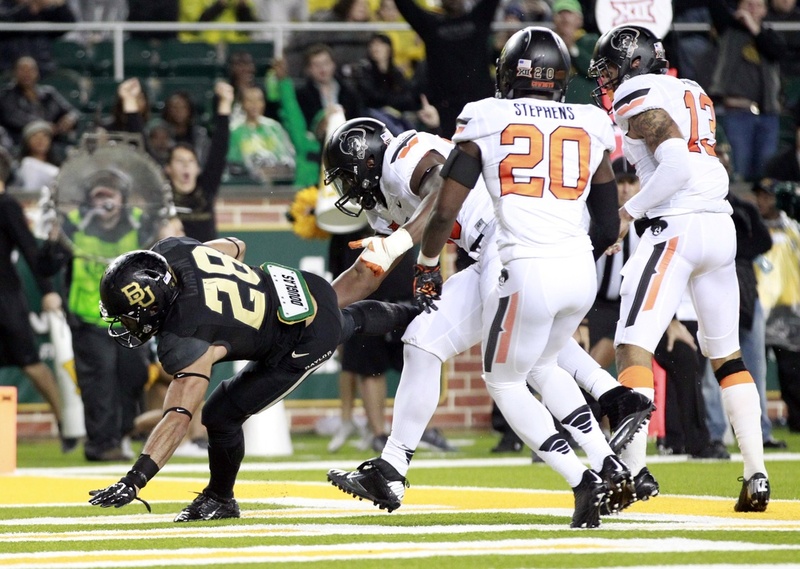 6:59 p.m. — How are all of Baylor’s receivers always open? I know that used to be our MO but it’s shocking to see sometimes. 7:01 p.m. — I do wonder if Petty will blame a Ramon slingshot move for that interception. 7:02 p.m. — Wow, Rudolph just threw a corner to Glidden that made me realize we should have been playing him since the second quarter of the Missouri State game. 7:03 p.m. — Rudolph has checked down more times on this drive than Daxx has in his entire career. 7:08 p.m. — Charles Davis is talking about backyard football at Thanksgiving. I need beer No. 2. 7:10 p.m. I have gone the entire first quarter without looking at my mentions. I’m oddly proud of this feat (and much less annoyed at the human race than usual). 7:14 p.m. — I laughed at this. Gus Johnson says Briles wants players who are big and fast. Show me a coach who wants players who are short and slow. 7:17 p.m. — Baylor is so undisciplined it’s unbelievable. I don’t know how they ever win big games. Also, they legitimately have better athletes than us (and maybe OU and Texas). I don’t understand. 7:19 p.m. — Mrs. Pistols just walked in. 7:20 p.m. — I can’t believe I’m saying this but I like that Rudolph can effectively run the zone read. Daxx is slower than I am and apparently Yurcich worships at the alter of Vince Young’s 2005 season so we might as well get somebody who can do it. 7:21 p.m. — This is perfect. 7:27 p.m. — I’ve heard Sam Wren’s name more tonight than I have all season. I’ve also heard more pads popping tonight than I have all season. Fox juicing its mics or OSU defense rising to the occasion? 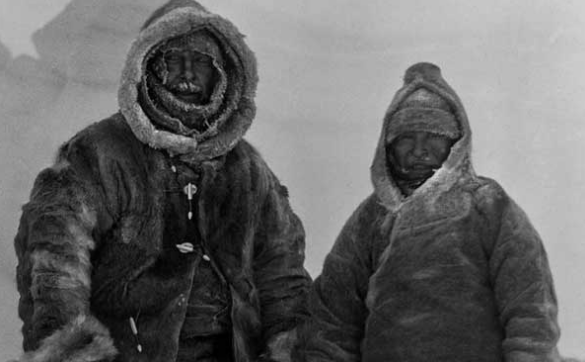 7:33 p.m. — You might need these guys to handle this take but I really like Rudolph so far. It’s not like you can project his entire career onto this first half but he looks better than what I would expect a really good four-year starter to look like in this position. 7:38 p.m. — I’m not Carl Bernstein or anything but I would ask Gundy why Tyreek was playing so much punt coverage in the postgame tonight. Are they trying to make him tired so they’ll have an excuse as to why he didn’t get more touches? 7:41 p.m. — Baylor is really good at getting first downs just beyond the first down marker. OSU is good at having fourth downs just in front of them. 7:45 p.m. — Does everyone know the Art Briles rumor about how he has Texas Tech tattoos on his arms which is why he always wears long sleeves? I have no idea if it’s true but I just thought of it and it made me laugh for some reason. 7:47 p.m. — Baylor’s kicker just missed a field goal and the @cowboyfb Twitter account reacted like it was the AFC Championship game. By the way, if you had to play a game where you had to blindly draw positional players in the Big 12, more people would get closer to correctly drawing what Baylor’s kicker looks like than any other team’s player. 7:49 p.m. — They just showed Yurcich in the press box and I’m 85 percent sure he was playing Angry Birds on an iPad Mini. 7:51 p.m. — OSU is (obviously) going to lose this game but I’m bullish on Rudolph. I think he looks poised, has a good arm, checks down well and can run a little bit. You clearly need more than a quarter and a half to evaluate somebody but maybe he’s a good middle ground between Daxx and General Patton. 7:55 p.m. — I’m also encouraged that Rudolph’s intermediate passing game is strong. When Daxx was going well he was just tossing it as far as he could and praying. Rudolph seems to have a little better touch than that. Also, still not sure his pulse has hit 80 tonight. 7:57 p.m. — The only thing I dislike about Rudolph so far is his shoe game. He needs to get Zac and/or Weeden’s cell number and get some help. 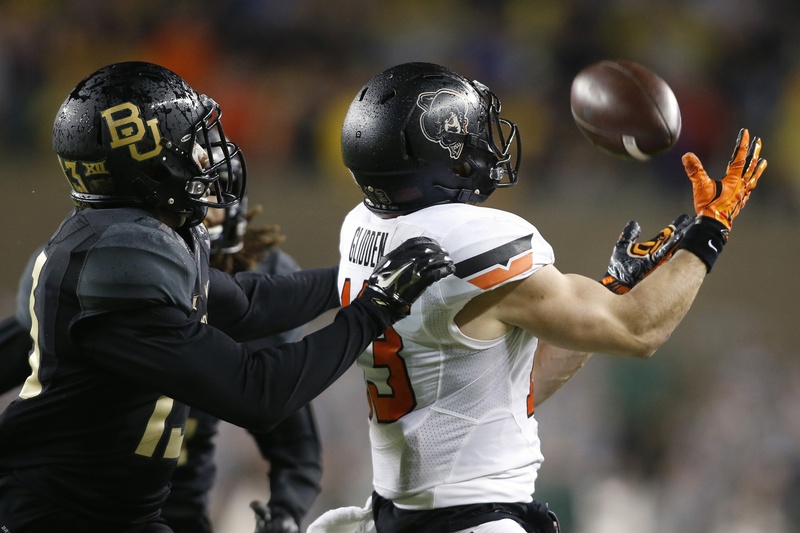 7:59 — Shawn Oakman is like a bigger Samaje Perine if that’s possible (I didn’t think it was). 8:01 p.m. — Things I need in my life less than the Baylor students running across the field in the pregame: Charles Davis making Brittney Griner/Shawn Oakman jokes. 8:04 p.m. — I like Rudolph’s wheels. He just scrambled at the goal line on second down — it would have been a 10-yard loss with Daxx out there. 8:07 p.m. — Oh my, Rudolph just threw the first TD of his college career to David Glidden and it’s 28-14 at halftime. The third-string QB streak is alive and well! 8:08 p.m. — I just saw the steel baron from the northeast in uniform. He’s skinnier than Ibrahima Thomas. 8:05 p.m. — Serious question: what do you think Gundy wouldn’t tuck in? Would he tuck this in? 8:20 p.m. — Is Gundy texting Jeremy Foley right now? 8:24 p.m. — Yep, this is nuts. Most incredible (unfathomable?) stat of the first half: #OKState has not allowed a sack. Brandon Weeden noted here that some of the sack issues could be QB-induced and it did look like Rudolph was better at making quick decisions. 8:25 p.m. — I want to be clear about this: I don’t think Rudolph has been elite or anything thus far, I just think you can tell that he’s going to be really, really good. Maybe we all said the same about Daxx and I’m just getting carried away but this isn’t Texas Tech and I feel like he does things that Daxx can’t or didn’t do. 8:33 p.m. — I sure wouldn’t want to see a screen to Tyreek or a wheel route to Tyreek or anything other than Tyreek on the punt coverage team. 8:36 p.m. — I hate admitting this but I really like Baylor’s all blacks. Great look with the gold numbers. This is actually a tremendous uni matchup. 8:37 p.m. — Jordan Sterns is the hardest hitter in the OSU secondary since…? Lucien Antoine? 8:40 p.m. — Larry Stephens just picked off Bryce Petty and Teddy KGB keeps speaking to me. OSU is haaaanging around. Alley-gay-tor bluud. Wait…forget the Gator part. 8:41 p.m. — My favorite play of tonight so far — Rudolph was lingering in the pocket near his own goal line and he ducked out of the way right as the defensive end rolled up his back. He knew he was there even though he couldn’t see him. It’ll go down as a sack in the box score but his field presence is impressive so far. And OSU’s offensive line will (hopefully) improve. And yes, I’m grasping at straws right now. 8:51 p.m. — Third and one on our own 10 and our line is awful — good idea to not roll Rudolph out and instead run it up the middle with our fullback. 8:55 p.m. — Glenn Spencer looks like he should be at a middle school dance recital in that orange hat. 9:11 p.m. — A buddy just stopped by my house to hang out. I was grateful for the 15-minute distraction. Oh what’s that, it’s 42-14. Great. 9:12 p.m. — This’ll sum it up nicely. 9:17 p.m. — Oh my, they took the reins off and Rudolph just hit James Washington in stride for a bomb touchdown. Let it ride, Gundy. Let it ride. What a throw. 9:22 p.m. — Looking back at the box score, if OSU could figure out how to avoid giving up two TDs as fast as humanly possibly maybe it would be more competitive. Seriously, Pokes have given up two TDs in the first quarter in each of the last four games. 9:26 p.m. — Oh, the fastest player in college football. There he is. By the way, sometimes I have to make sure my DVR isn’t in fast forward mode when he’s running. He’s absurd. 9:27 p.m. — Rudolph’s reads are just so much better than Daxx’s. I don’t know how else to say it. His check downs are better, his initial reads are better, he’s just a better quarterback. 9:30 p.m. — 42-28 Baylor. Football is fun again. That’s the best compliment I can give Rudolph. 9:30 p.m. — This is true. Much will be made of Rudolph's performance tonight, but tons of credit goes to the o-line. Crabtree back in the mix, Veatch out. Been solid. 9:32 p.m. — Wow, that hit Petty just took was like Zac against Oregon in the Rose Bowl. 9:34 p.m. — I just laughed out loud at the graduate assistant who had to put the heavy rain jacket on Bryce Petty after another unsuccessful drive. I don’t know why. Probably the beer. 9:36 p.m. — Rudolph is eight of his last 10. Things are happening. I need another beverage. 9:38 p.m. — My gosh that third-down throw to Glidden was insane. 9:41 p.m. — This catch though. I am feeling emotions. They are good emotions. 9:44 p.m. — Now they are bad emotions. Rudolph was just picked off to effectively end it. Man, what a night though. 9:47 p.m. — Fox’s cameras are locked down and this is the most anti Gus thing ever. Can you imagine trying to watch games like this with him calling them? Torture! 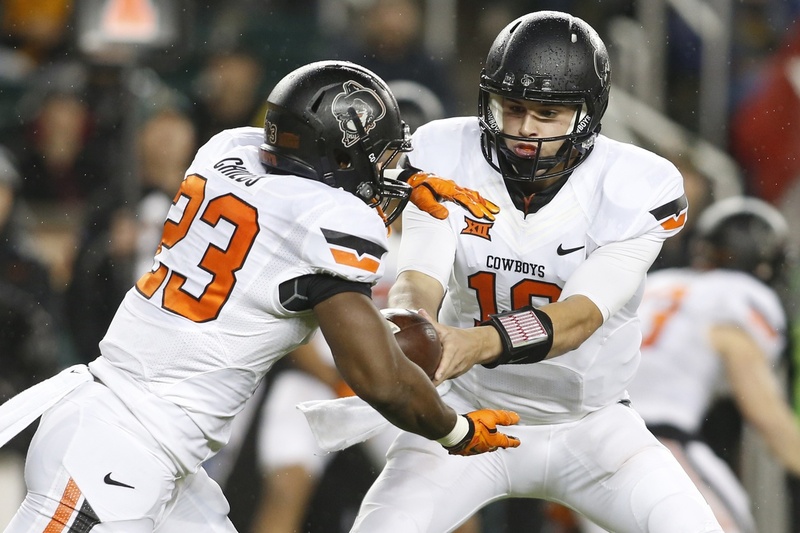 9:50 p.m. — Gundy will start Taylor Cornelius for Bedlam. 9:51 p.m. — Let’s not act like Rudolph was Weeden tonight but there is not a more difficult situation to be put into (okay, maybe Bedlam) and he handled it admirably. I’m in. We can talk about stats — and Rudolph’s are fine — but I know what I watched and it was a true freshman that gave zero Fs about who and where he was playing. I couldn’t be more impressed. 9:52 p.m. — We are going to cover so hard. 9:55 p.m. — We covered! 9:57 p.m. — It’s been fun, guys. Way, way more fun than I thought it would be. Maybe Gundy won’t go to Florida and maybe there won’t be a QB controversy next season because No. 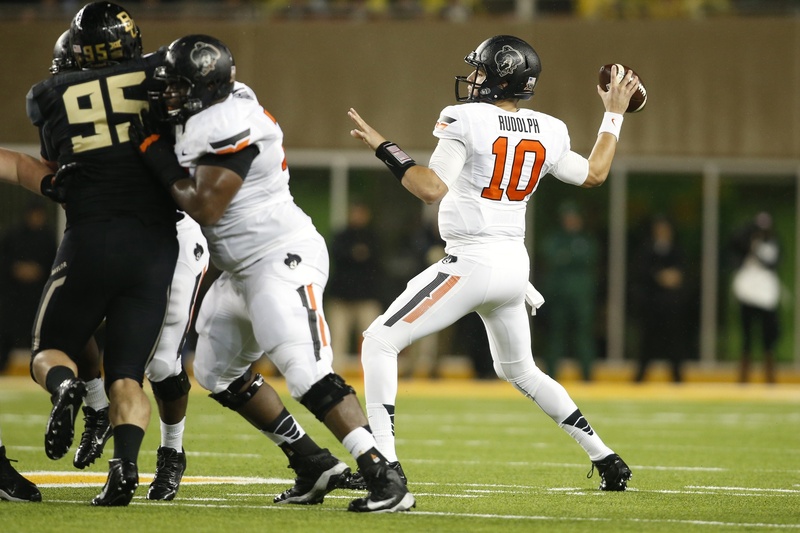 10 is really good and maybe, just maybe, Oklahoma State waltz into Norman and cause an uproar in two weeks.